did Xion ruin roxas and namine's relationship? and should namine's just move on? Roxas at first loved xion (yea im aware not love just friendship in this game) but after she disappeared roxas forgot about her he started to developed some certain of bond or connection with namine so what do you think is the bond between them still exist or should namine's just move on? To me Roxas and Namine didnâ€™t have a relationship to begin with. They had a few conversations over the span of 7 days and any chemistry and bonding they did have was over the tragedy of their existences. They just never clicked to me and I didnâ€™t appreciate it feeling forced like it was meant to be at the end of KH2 when they hardly knew each other to begin with. I also disliked how it seemed they where pushed to be a match just cause they where Sora and Kairiâ€™s Nobodies. To me that subtracts what Roxas stood for which was that he was his own person not Sora. Rikuâ€™s relationship and screen time with Namine was more existent than with Roxas. At least thatâ€™s how I feel. I think R&N just met each other at a really lonely and turbulent time, so it was easy for them to latch on to that bond. It's like they'd found the only other person in existence who understood their pain. Especially after everything Nami went through in CoM, she was obviously very lonely and didn't have much self esteem. It was probably really nice to find someone who actually cared. Then Roxas had just found out his friends were computer programs or whatever and his life was some Matrix-style lie. So yeah, they both needed a friend. As far as comparing him with Namine or with Xion though, I don't really know what to make of those ships. If I had to choose, I think Roxas and Xion would win here. They had way more time to get to know each other, so it would make more sense to me that they'd get together vs him and Nami. I would really like it if Roxas and Namine were close friends in the end though, regardless of if he got with Xion, or nobody at all. We need better girl/guy friendships, without there being any romance implied, or the whole brother-sister thing. Yes. Xion ruined every straight ship that was ever supposed to become canon. She and Namine move on together, Roxas x Axel is confirmed, Riku and Sora announce their marriage while "Chikai" plays in the background and Kairi and Selphie are depicted watching the sunset from the beach with a jump rope draped over both of their shoulders. Kingdom Hearts is saved. Lmao. What relationship? The title had me choke. But considering the user seems young and genuine, I'm not going the sarcastic route here. Roxas and NaminÃ¨ do have romantic subtext underlying their otherwise normal interactions (if you took said subtext away, it is actually normal). They even made sure to somehow implement it in Days by pulling the Girl of my Dreams trope again despite Xion existing. Then the 2.8. credits. There's a point the creator is making here. I just hope they handle it well in the future once they both come back. There's a difference between loving someone and being in love with someone. But as it is, it's still a newly created bond of friendship and Roxas and NaminÃ¨ are not in love with each other (or harbour feelings for one another either). Attraction, interest, a spark, etc. Maybe. That's a more fitting description. The "we can be together again!" is also a grossly misinterpreted scene due to the extreme focus on subtext by others than the main point. And rather than it boosting Roxas/NaminÃ¨, it was made to boost SoKai in my opinion. NaminÃ¨ originally says in Japanese that "we can meet each other again!". While their time was limited, Roxas was in a moment of loss and needed answers. NaminÃ¨ made a point of guiding him and halting Diz's cruel plan of making the boy return to Sora blind. Her role was basically akin to that of an angel (with the cinematic symbolism to match, as she had this ethereal quality in KHII). They had moments to talk, about deep topics no less, and got to know each other a little. They bonded through their similar circumstances. I feel that's what spurred NaminÃ¨'s determination to help him. What was happening was unfair. In the end, they got along well and liked the company each of them provided. NaminÃ¨ tried her best to reassure Roxas when Diz was manhandling her, and she wanted to say a lot more. At its core, she had to state that no, he won't disappear, and that no, he won't be alone, because even if they may not recognize each other, they will meet again (a.k.a. they'll be whole). The scene in TWTNW continues this. NaminÃ¨ speaks through Sora to Roxas, saying she thought Nobodies were doomed to fade. Instead, they're able to see each other as they remember one another to be (that was the basis of Roxas' convoluted jargon). They need one another to continue existing. Any time Sora and Kairi are together, they're together. And they aren't suffering through their fate alone. It's the only positive thing they have to hold unto at that point in the game, so they accept things as they are. Hence, "we can be together!". KHII I believe was trying to conclude their stories and make them content with their end result. Which is why they look happy. Things have changed now though. I know that people are going to compare the amount of time spent Xion and NaminÃ¨ each had with Roxas. Xion wins in this case. Yet that doesn't mean anything if Roxas and NaminÃ¨ are to return in KH3 and perhaps get to strengthen their friendship more. Or even beyond this if there's another saga. I doubt they're gonna be canon by the third installment. Seriously doubt it. Too much stuff to cover. Nonetheless, you can know a girl/guy friend for years, but they meet someone else one night at a bar or something, and have a romantic connection with that person that they didn't have with said friend. It's real life at work here. So NaminÃ¨ doesn't need to have known Roxas for almost a year to make sense of them being romantically linked together. Different people do different things to others. Whatever happens, good luck with the ship wars, if any. The "we can be together again!" is also a grossly misinterpreted scene. And rather than it boosting Roxas/NaminÃ¨, it was made to boost SoKai in my opinion. NaminÃ¨ originally says in Japanese that "we can meet each other again!". While their time was limited, Roxas was in a moment of loss and needed answers. NaminÃ¨ made a point of guiding him and halting Diz's cruel plan of making the boy return to Sora blind. Her role was basically akin to that of an angel (with the cinematic symbolism to match, as she had this ethereal quality in KHII). They had moments to talk, about deep topics no less, and got to know each other a little. They bonded through their similar circumstances. I feel that's what spurred NaminÃ¨'s determination to help him. What was happening was unfair. Nonetheless, you can know a girl/guy friend for years, but they meet someone else one night at a bar or something, and have a romantic connection with that person that they didn't have with said friend. It's real life at work here. So NaminÃ¨ doesn't need to have known Roxas for almost a year to make sense of them being romantically linked together. Roxas and NaminÃ¨ are still being shipped. But there hasn't been new content. And they are their own people. So instead of NaminÃ¨ being the Kairi to Roxas' Sora, it should be just Roxas and NaminÃ¨. 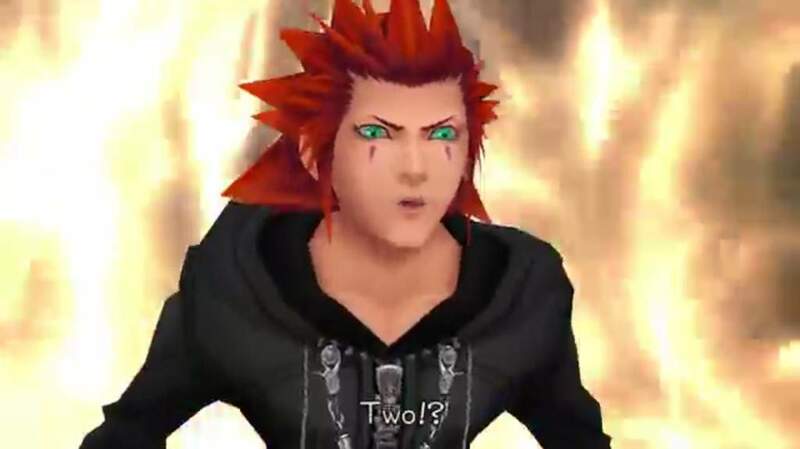 My boi Roxas takes influence from Sora and makes it double. Sora has a keyblade and he has Kairi. That's cool and all...but Roxas has two Keyblades and two Kairis. Roxas is the master of dual-wielding.